Flirting with blogs and social networking sites may lead to a significant boost in traffic. Ask British fashion retailer TopShop.co.uk. Five percent of the traffic to its online store came from its MySpace profile, which meant it was the second biggest source of traffic and “more than twice as much traffic than was received from MSN and Yahoo Search combined”. 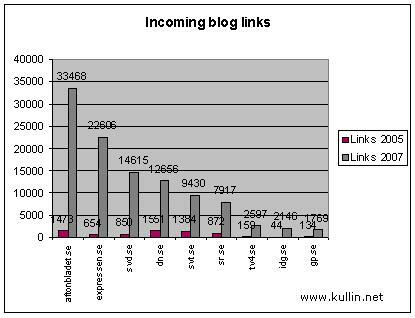 Mainstream media can also benefit from the links that for example bloggers provide. In May 2005 I checked the number of incoming links to a number of Swedish media sites and found that Dagens Nyheter had the highest number of incoming links (via Technorati) of those media sites and blogs. Today we can see a huge increase in incoming links to media sites, and the increase for Expressen, for example, has been more than 3,000 percent. Dagens Nyheter has not been able to maintain its top position. But recently both DN, Aftonbladet and Svenska Dagbladet have started to publish blog links next to their articles and a follow up in six months time will show if that has had any effect on “link love” from Swedish bloggers. Tags: technorati, sweden, expressen, svd, aftonbladet, svt. Ping.